Adrian was honoured as our 2017 Volunteer of the Year for his deep commitment and outstanding contributions to Symphony Nova Scotia. Every season for the past 12 years, Adrian has researched, prepared, and presented a half hour pre-concert lecture to help educate our Masterwork Series audiences about the music they are about to hear. As Chair of the Program Advisory Committee for ten years, we experience Adrian’s constant yearning to learn more about music, including the latest in the industry, and his desire to help others broaden their appreciation and experiences. His leadership and knowledge are helping us through the process of finding a new Music Director. 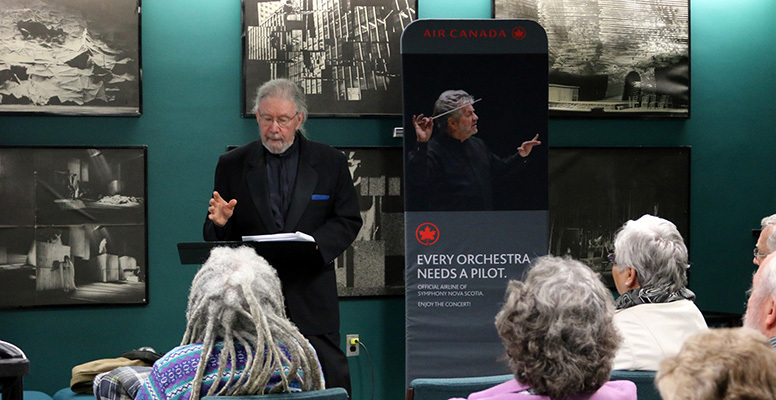 Adrian’s professional life and volunteer roles interconnect: musician, composer, conductor, arranger, producer, host, broadcaster, educator, speaker, former Symphony Board member, pre-concert chat and Symphony 101 lecturer, Chair of the Program Advisory Committee, and recently added Music Director Search Committee member. The common thread of course is what binds us all… music.